The Complete Awesome Voice Changer Set! 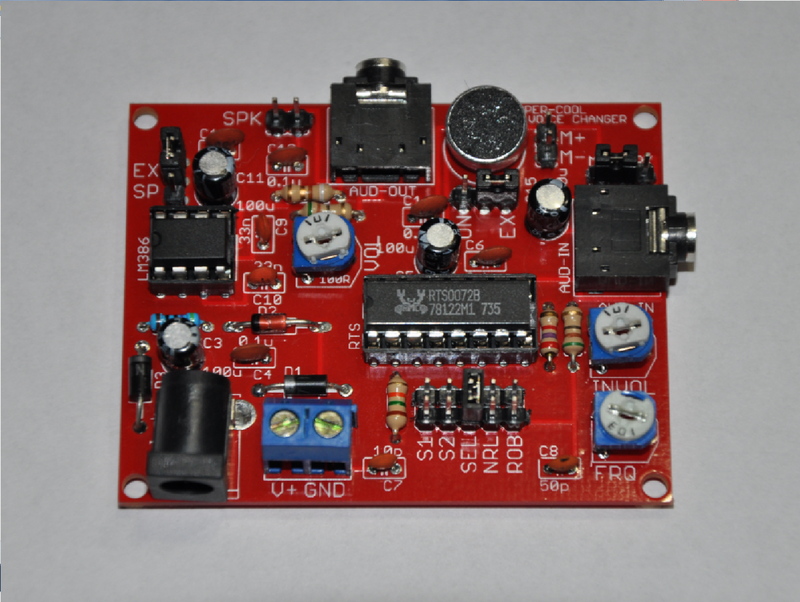 This complete voice changer set includes a fully assembled and tested voice changer board, a speaker, an external microphone, a stereo connector, and an AC-DC power adapter. This voice changer set was designed for a Kickstarter campaign, and was very successful! We now have enough stock to sell this set in full! There are so many ways that you can customize this board for your application. Full written instructions and a video manual can be found below. You can power this set with batteries, or with the included AC-DC wall adapter. You can use the on-board microphone, or you can use the external microphone connector. You can use the speaker connector as an audio output, or you can use the stereo connector to connect to an external amplifier/speaker set! You can also use a stereo connector to manipulate audio coming from an external source as opposed to audio coming in through either of the microphones. If you have any questions, please do not hesitate to let us know. If you wish to purchase this kit without certain accessories, you can contact us, and we can send you a custom quote! The video below gives a great demonstration! Thank you for taking an interest! The AC Adapter/Battery Connectors: You can use either a 5mm AC-DC adapter jack or the 2-pin terminal block to apply power to this unit. A few of the reward tiers come with an AC adapter. You can use an AC adapter and a battery at the same time if you'd like. There is a battery-backup circuit on the board, so both power supplies can be implemented at the same time! This set requires 7.5VDC - 12VDC. The nominal power supply is 9VDC. Mode Selection Jumpers: This rail allows for you to choose between a robotic voice, an amplified voice, a voice that is transposed between a very high and very low frequency (adjusted manually by turning the FRQ variable resistor), and setting your transposed voice to a fixed very high, somewhat high, somewhat low, and very low frequency. Frequency Adjustment: This variable resistor allows for you to manually set the frequency of your transposed audio signal when the "SEL" jumper is shorted on the mode selection jumper. Input Volume Adjustment: This variable resistor makes small adjustments to an external audio signal that is fed into the audio input jack. Adjusting this can act to "clean" the signal in case the input signal is too large, and causes clipping at the amplifier stage. Audio Input: You can connect an external audio input signal here with a stereo-stereo connector. Mic/Input Selection Jumper: Select between using a microphone or an external audio signal with this jumper. On-board Microphone/External Microphone Connector: This set comes with an on-board microphone. If you wish, some reward tiers come with an external microphone on a wire connector that you can plug into the board. This was implemented in case you wish to add this set into a costume. Audio Output: The audio output jack requires a stereo-stereo connector. The output signal is fed to both the left and right paths. This signal is to be fed into an external audio amplifier, such as a set of computer speakers or Bose player. Speaker Connector: Connect a speaker here. Many reward tiers include a speaker with connector that plug directly and easily into this connector. 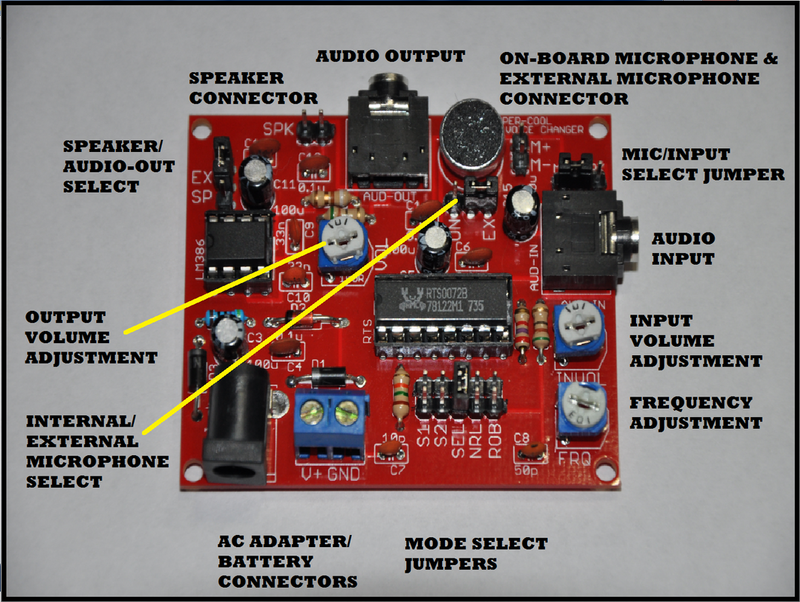 Speaker/Audio-OUT Selection Jumper: Select between using a speaker or the audio output with this jumper. Output Volume Adjustment: This variable resistor allows for you to adjust the volume of the output signal (To the speaker or audio output). Internal/External Microphone Selection Jumper: Select between using he on-board microphone or external microphone connector with this jumper.